Clearly things have been happening out there! 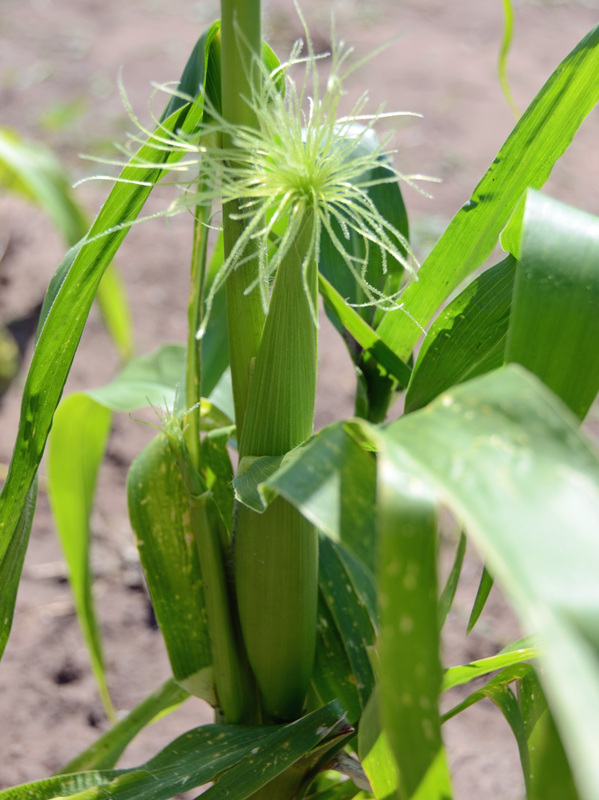 A few of the stalks of corn have the beginnings of ears, we’re taking regular cuttings off the herbs, the Asteraceaes and the Chenopodiaceaes (Gotta keep up my plant biology terminology! But for those of you not trying to keep up your plant biology terminology: lettuces and chards.) 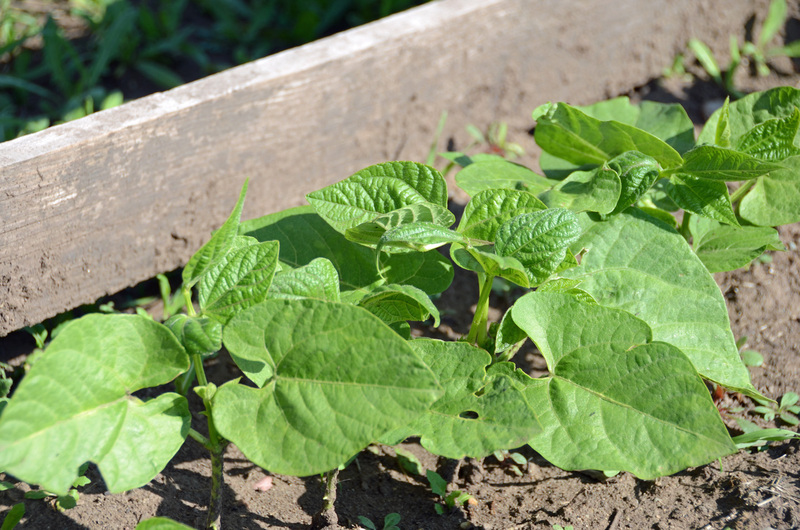 are going gangbusters, you can hear the beans growing, there’ll be flowers on the squash any day, and the strawberries are turning red. And of course, the weeds are constantly threatening hostile takeover. 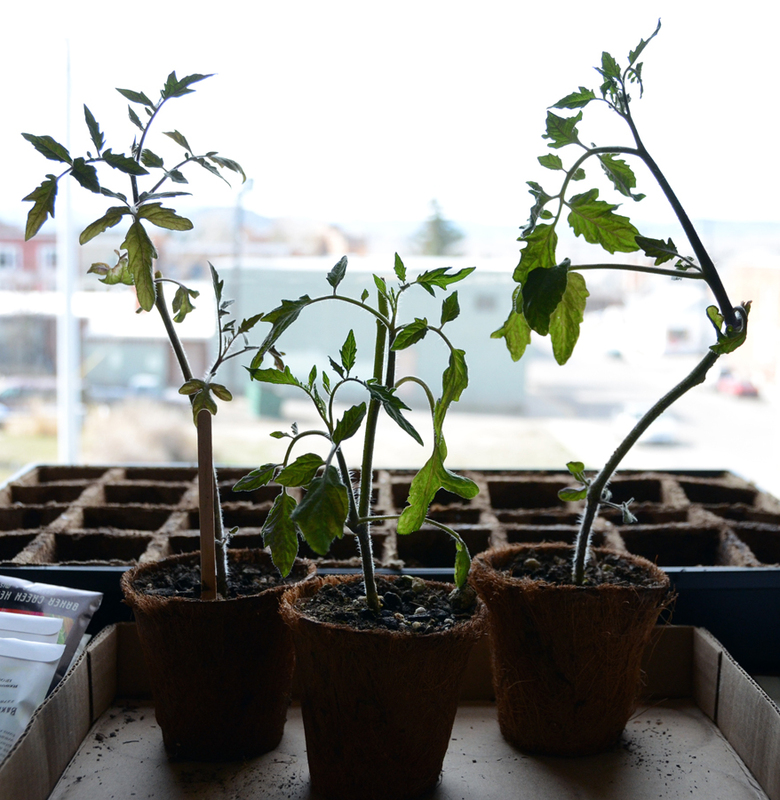 My tomato plants are pretty pathetic looking. They got thrashed by the hail storms. One of my neighbors has beautimus-looking tomatoes. I have Solanum lycopersicum (woo plant biology!) envy. 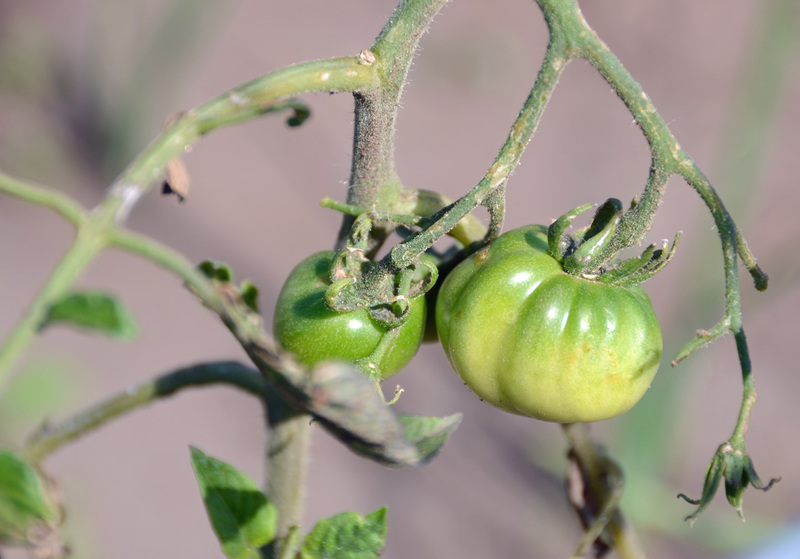 However, despite their ragged appearance, there are several little tomatoes on each plant. We won’t have much of a tomato harvest, but will we have one at least! 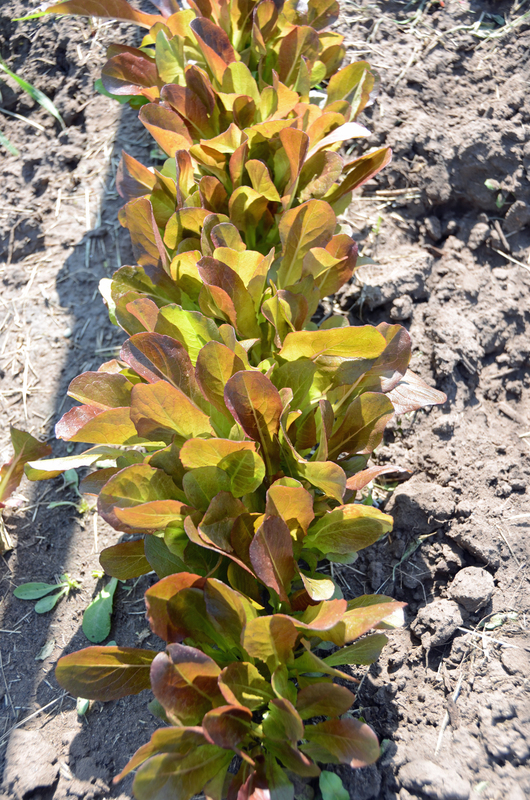 My red romaine lettuce looks great. This is the second year I’ve used seeds from Baker Creek, and I’m again pleased with the results. Isn’t that some great color? We’ll be doing our first harvest tomorrow! Exciting! 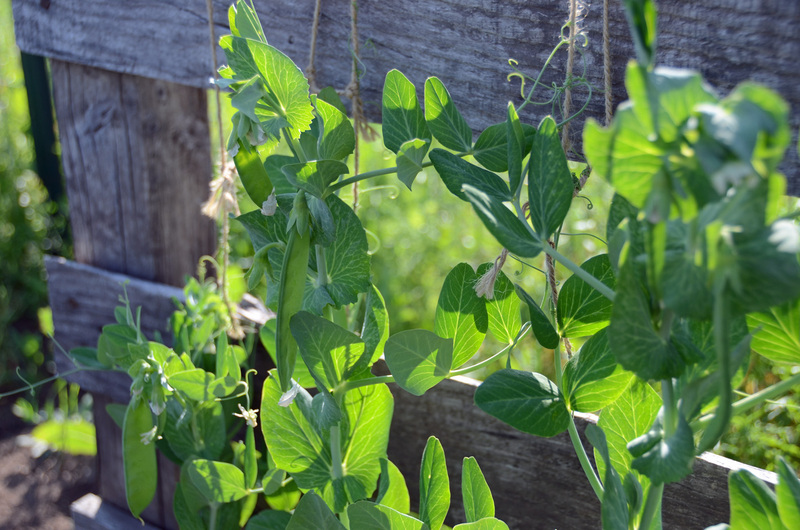 Here are my snow peas. They’re just getting big enough to need to climb the trellis. 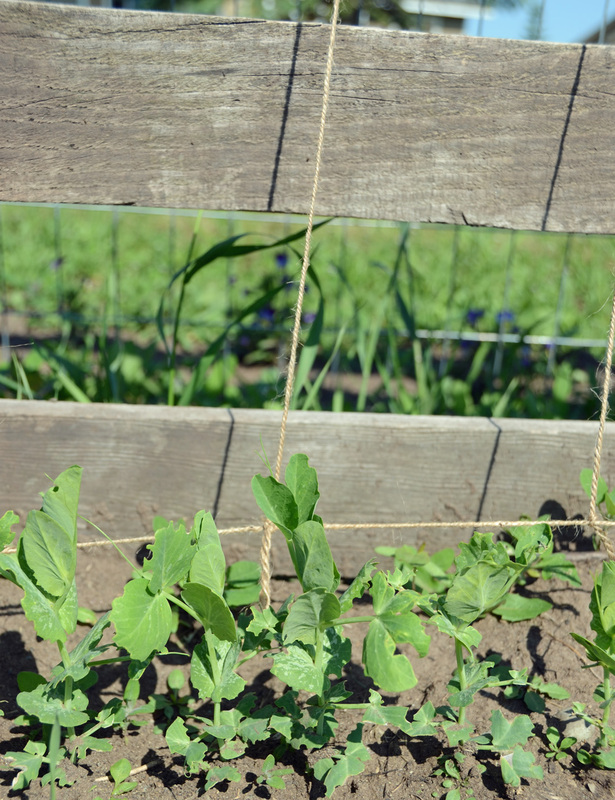 Yesterday I put out some twine for the vines to climb onto the piece of old wooden fencing we found in the field that we’re using as the trellis. This is my first time growing onions, but clearly they don’t need much assistance! I planted the onions from sets I got from my mother-in-law and they’re thriving. They’re nearly a foot tall! Here’s hoping the onion bulbs below look as great as the shoots above. 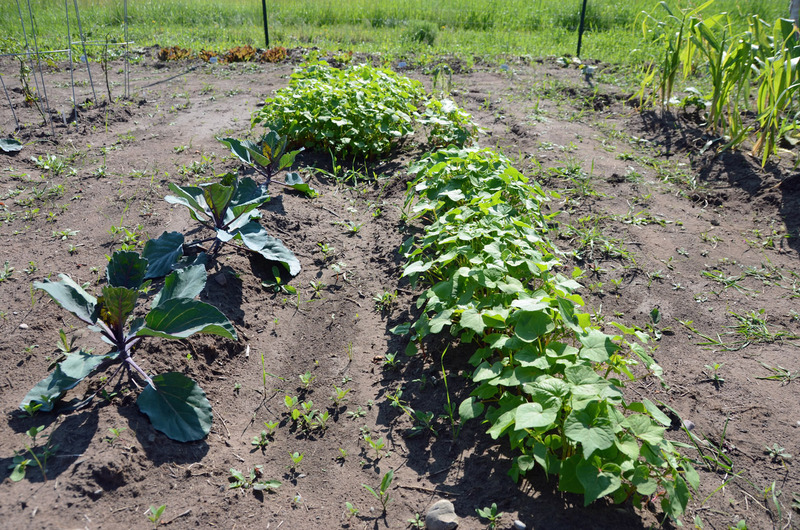 In an effort to beat back the weeds and put some nutrients back into the soil, we’ve planted a lot of buckwheat in various places around the garden. 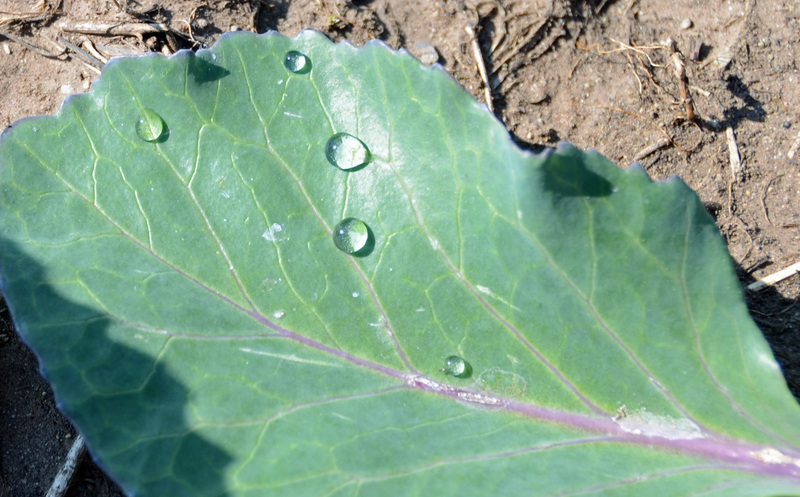 In the above photo, it’s the lush looking stuff with heart-shaped leaves to the right of and behind the cabbage. Buckwheat is a great smother crop, and, if turned under once it flowers, makes a nice green manure. So far, we’re pleased with the results! So much so that we recently seeded a bunch more around the garden to help with the weed problem (darn thistles, grass, and bunches of unnamed nasties!). Here’s those beans I was talking about earlier. They’re doing great. Totally exceeding my expectations. Of course, I didn’t expect them to do anything at all, but then again my problem last year with them was more likely the climate than the beans. I’m glad they’ve decided to be the all-stars of the garden this year (so far). I’m not kidding when I say you can practically hear these guys growing. My husband and I are very pleased with the garden’s progress. 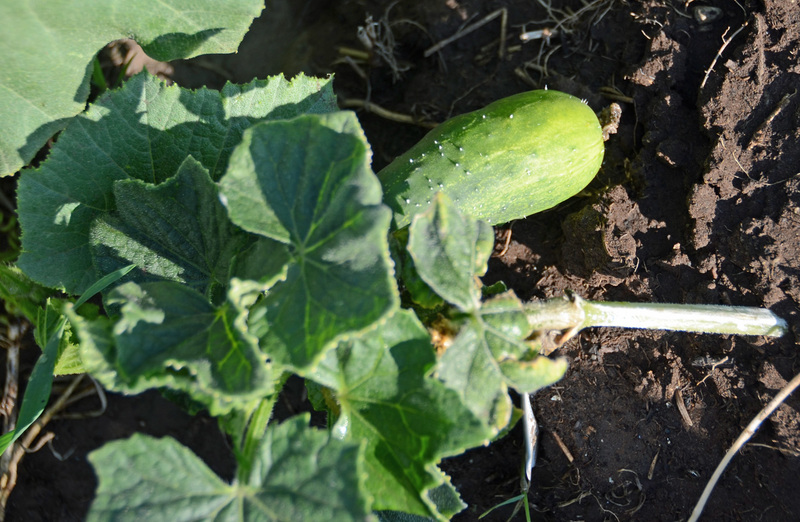 And impatient too, because we want to start harvesting! Good thing the romaine is ready. A week ago, before planting the transplants I bought, my husband built up five more beds in the garden. We ran out of the horse manure compost that a friend with a horseback riding operation gave us, so we used organic compost from a local gardening shop in these beds. We laid a thin layer of compost, and I added some organic bone meal, too. I did this, because, as mentioned before, my soil test showed that the garden’s soil was lacking in nitrogen and phosphorus. 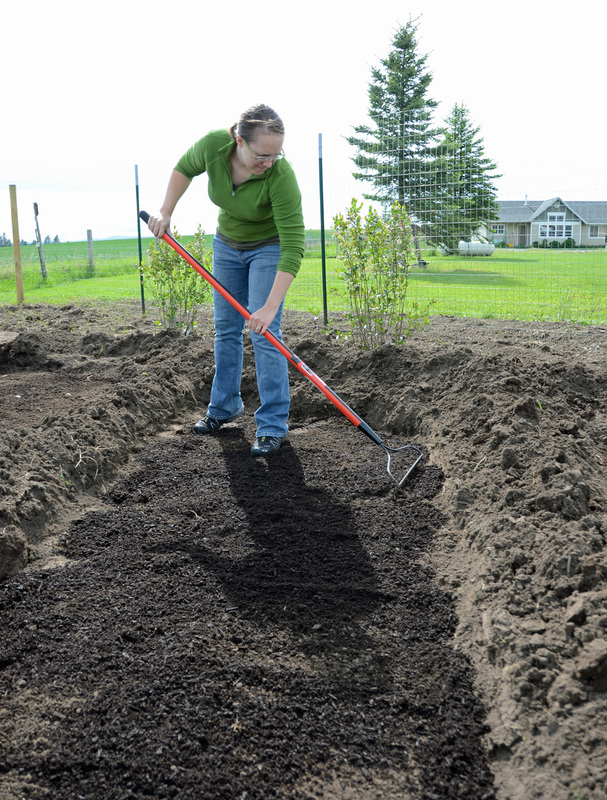 Here’s yours truly spreading the compost. Yes, I am wearing a fleece. Why? 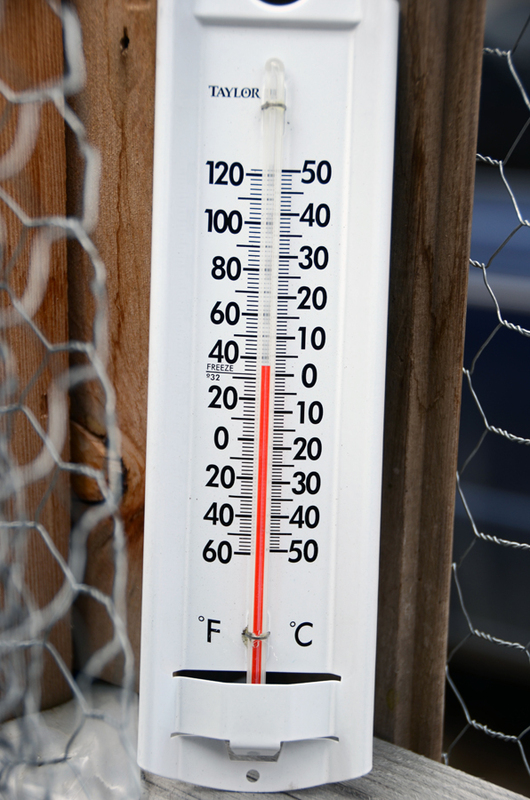 Because up here at 48 degrees (latitude), that’s also been the high temperature for a while. We have glorious autumns here, but cold and wet springs. In fact, there’s a winter weather advisory in our area today. Sigh. 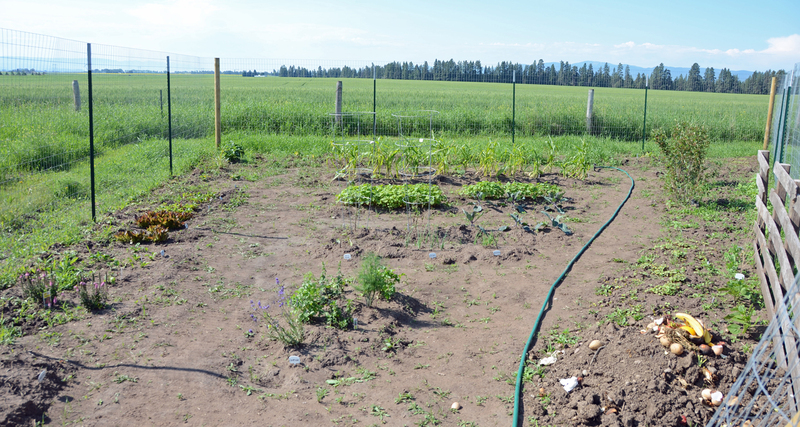 Here’s the garden as it was about a week ago after planting the transplants. I apologize I haven’t posted this sooner, but I’ve been busy, ya know. The garden looks much the same now, except the lettuces and carrots are coming up, as are the onion sets and the buckwheat. And the weeds. Oh the weeds. I weeded for half an hour yesterday and got one half of one bed done. Well, that’s what I get for not weeding for a week: Now I get to spend my free time weeding! Of the transplants I planted: I planted a pumpkin, a zucchini, a squash, two tomatoes, a pepper, mint, cilantro, shallots – all of these from the local Terrapin Farm. 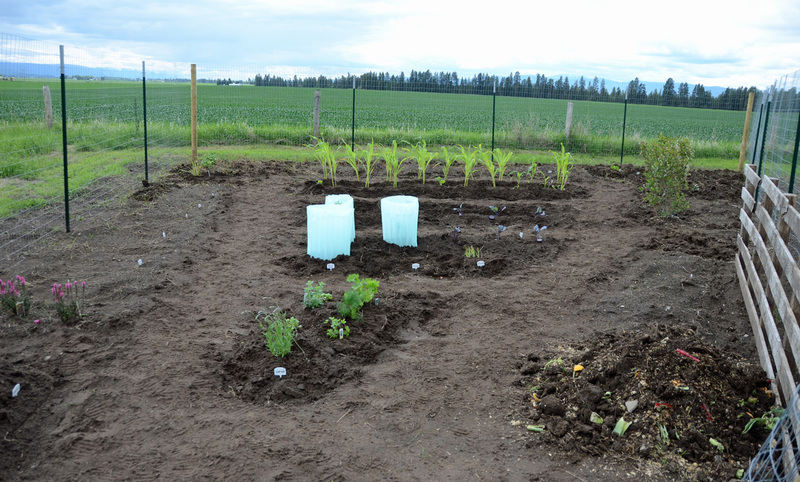 From a local greenhouse, I planted corn, more squash, cucumbers, cabbage, lavender, parsley, basil, oregano, and dill. From seed I planted spinach, red romaine, rainbow chard, ruby red chard, carrots, acorn squash, cucumbers, snow peas, blue lake bush beans, onion (from sets, technically), sunflowers, and a bunch of wildflowers on the outside perimeter. 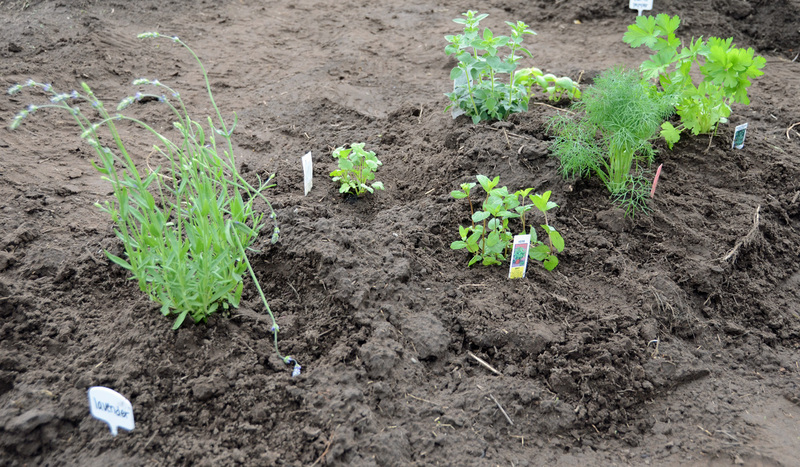 Here’s the herb garden we planted. In it there’s parsley, basil, oregano, cilantro, lavender, mint, and dill. We love to use fresh herbs in our cooking. 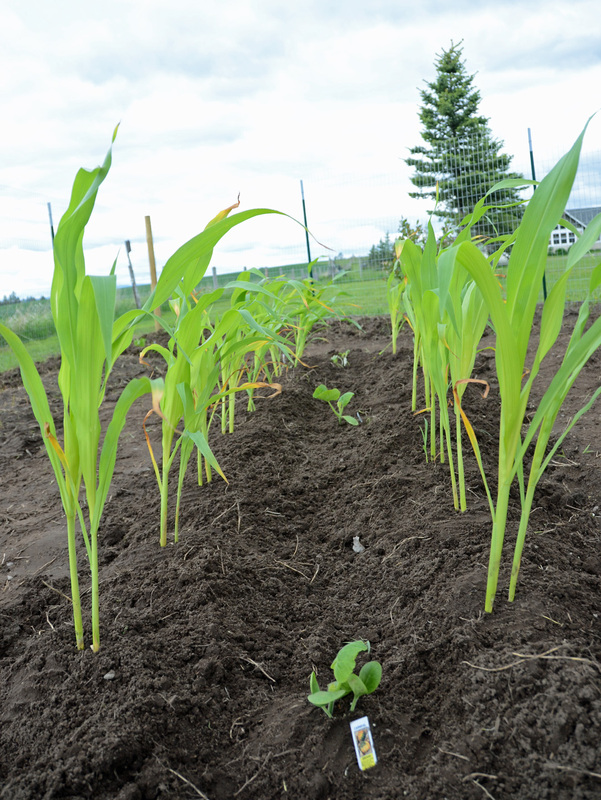 Here are the corn transplants. I will not be doing these again. At least not transplants that are this big. These transplants have taken an absolute beating with wind and rain, and yesterday, hail. They don’t have the established roots they need to stand up to the beatings, which, looking at the weather report, will continue until morale improves. Lesson learned. And yesterday it hailed for fifteen minutes. The hail was about blueberry size. Big enough to cause some damage. 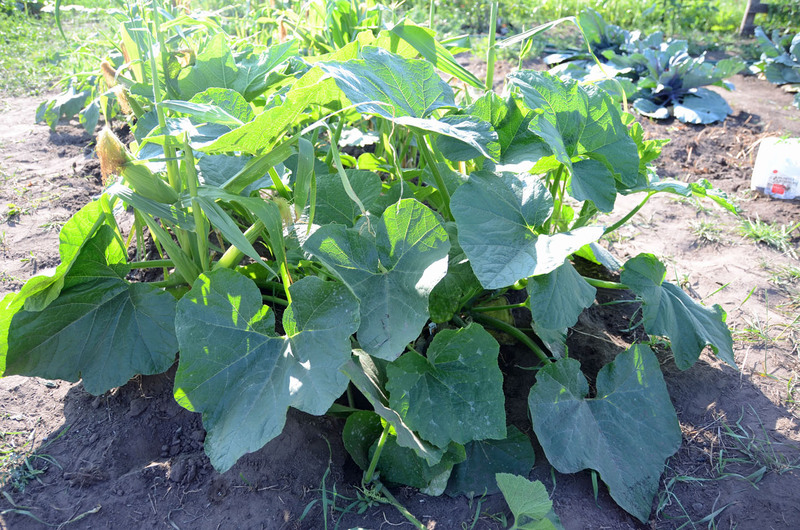 I think I lost a squash plant, probably some of the corn, and time will tell what else I’ve lost once the lake in the middle of the garden recedes. We also had a bird get in the house, trying to escape the hail (we had the door open because we were standing on the porch watching the hail come down). It flapped around inside for a few minutes until we could get it out. Hopefully the hail didn’t kill it! It is supposed to rain more today (and snow up high). The picture below shows the hail. 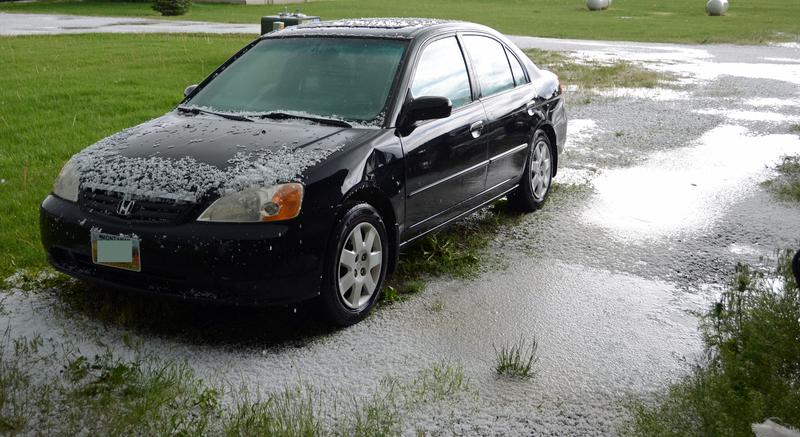 And the puddles full of hail that are probably three or four inches deep. It’s supposed to warm up in the next few days. Hopefully, if everything didn’t drown, I’ll see some real growth out there! I’ve got a lot more going for my garden this year. First of all, it’s not in Butte. And that pretty much sums it up. 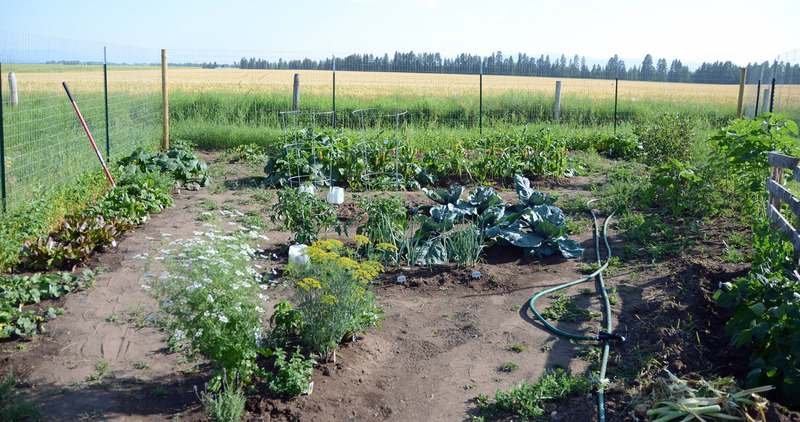 It’s pretty hard to grow veggies in a place where it’s likely to snow in July. This year’s garden is in a very sunny patch of my backyard. 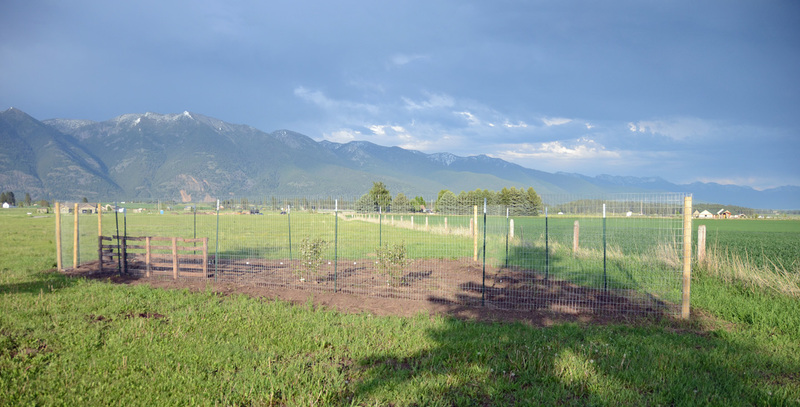 My husband spent a few long afternoons rototilling and such and building me one heckuvan awesome deer fence around it, too. 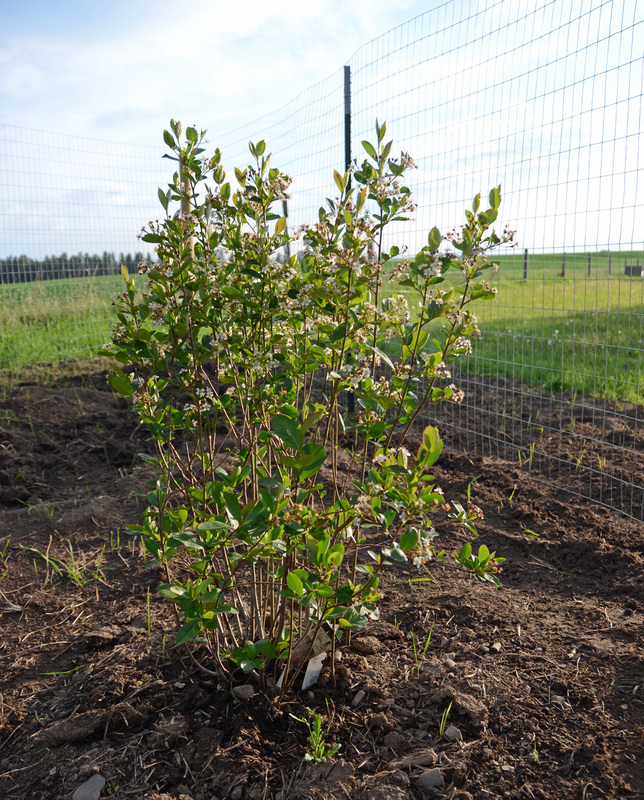 Before we left for our trip to the Midwest, I planted three strawberry plants, two aronia (also known as chokeberry) bushes, and some flowers in pots and in the garden. Upon our return, there was quite a lot of grass coming up that we had to pull and till under again (a temporary solution, no doubt; I have a feeling I’ll be fighting an ongoing war with the grass). Yesterday afternoon while our son napped we planted. We planted spinach, romaine, ruby red chard, rainbow chard, carrots, acorn squash, pickling cucumbers, slicing cucumbers, sunflowers, and chives. Outside the garden along the perimeter I scattered wildflower seeds. 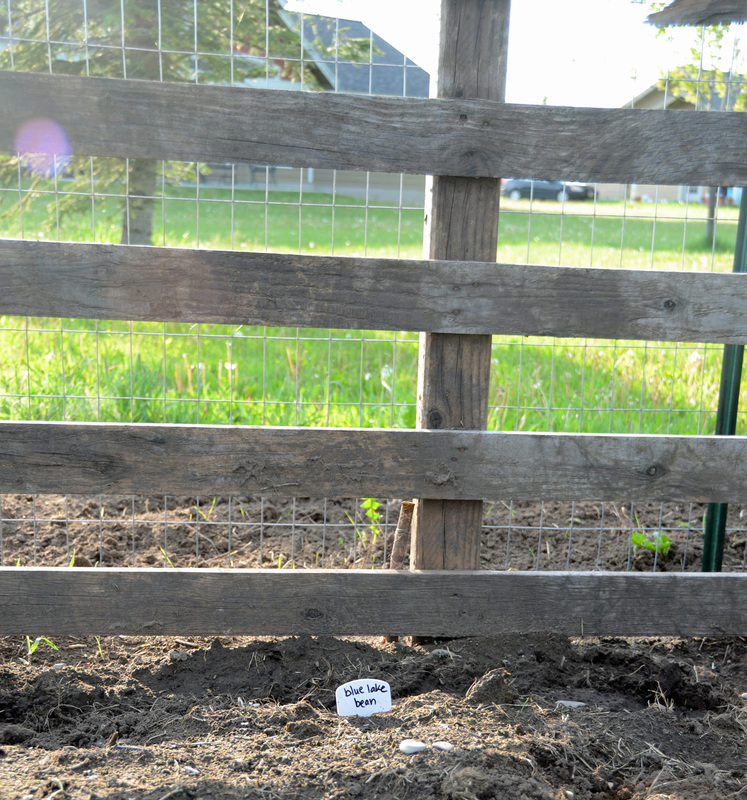 I also planted flax and black-eyed susans in the garden. 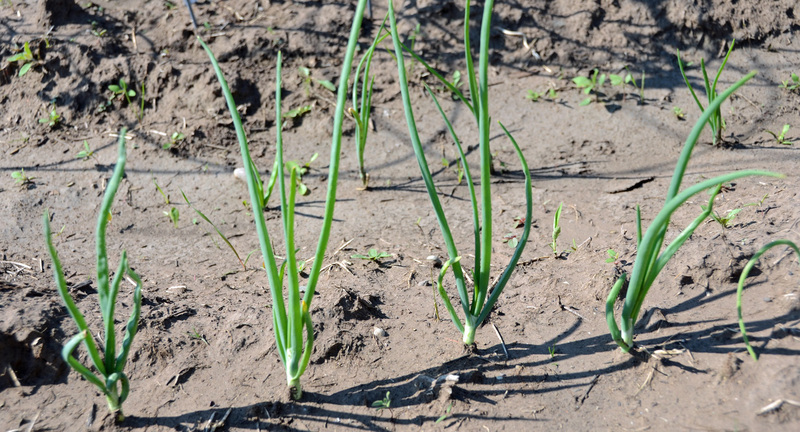 I would still like to plant some onions, corn, garlic (this fall), broccoli, tomatoes (either in walls of water or pots on the porch since our growing season here is so brief), and some other things. 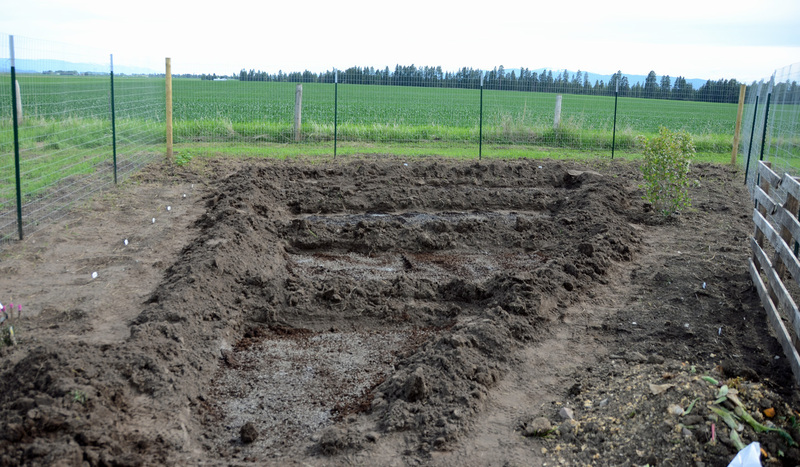 I’ve planted all the perimeter beds and just have the two interior beds remaining. Amazing how fast the space got taken up! I suppose next year I could make my walkways a little more narrow. On the right is our compost pile along one third of the wooden fencing we found in the field. 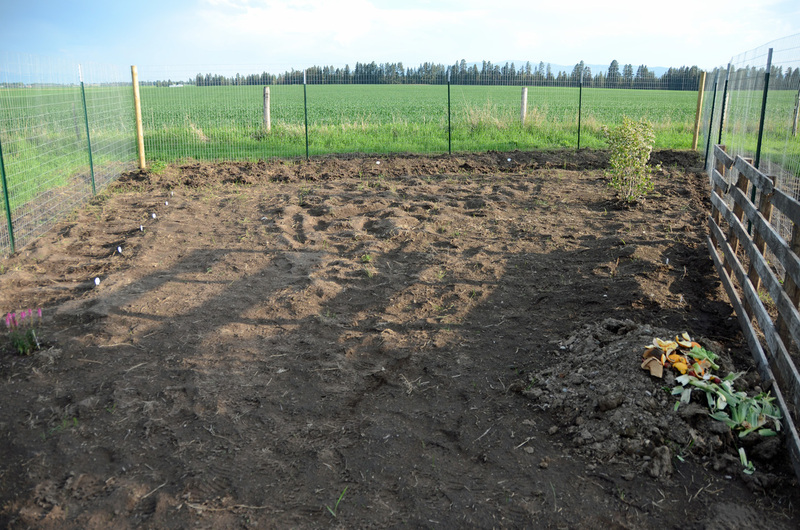 The other two thirds of the fence are where I planted snow peas and blue lake beans. 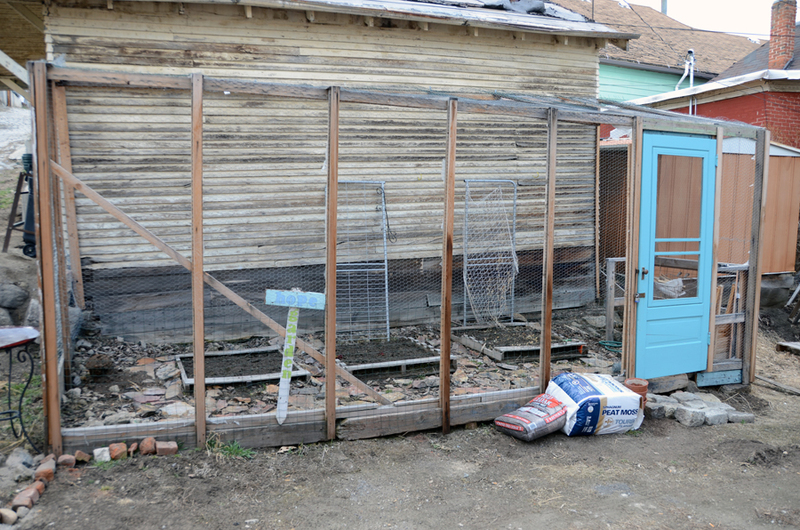 The fencing is for trellising. What I’ve planted so far is around the perimeter. The big spot in the middle will be two more beds soon. A few hours after we finished planting it rained heavily for ten minutes or so, complete with thunder and lightning. I’m glad for the rain, but I hope it wasn’t too much. Wouldn’t want it to flood out my seeds. I enjoyed listening to the heavy rain fall, the thunder rumble, and watching the lightning light up the walls. All this while I was feeding Jonathan before his bedtime. I hope he enjoys a good rainstorm as much as his parents. 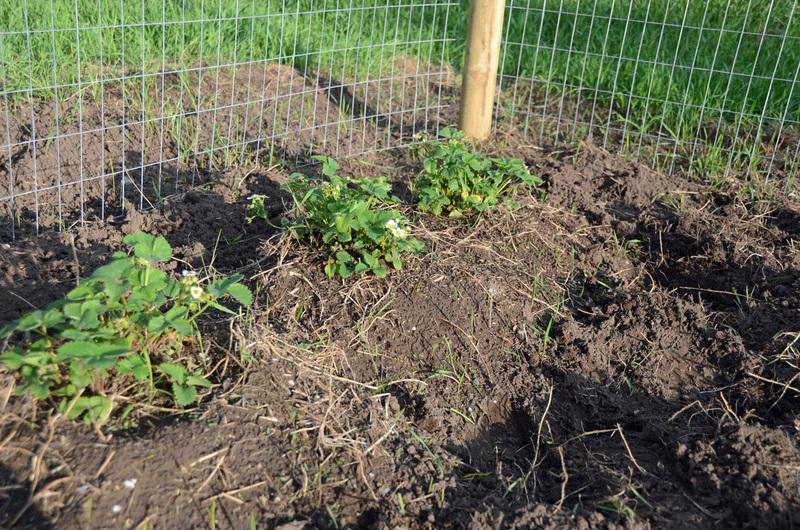 The strawberries have their own little corner of the garden. I’m hoping they take over that area and we get lots of strawberries every year. 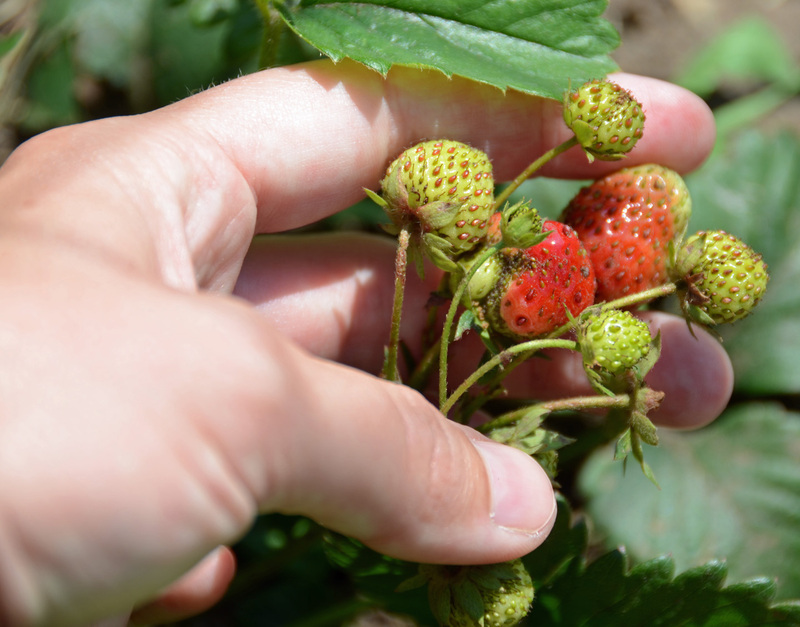 I decided to go with Junebearing strawberries as opposed to everbearing, which was the advice of my master gardener instructor. At least in our area, Junebearing strawberries provide a better crop. The variety I chose is called Sparkle. Maybe next year I’ll plant an everbearing plant just to compare. I’m a little fuzzy on the aronia details. The bush is supposed to grow to about 6 feet tall. I’m not sure when it will start providing fruit and whether or not I can harvest it this year. I’ll need to do some more research. Aronia berries make fab jam. I’ll be sure to provide frequent updates on the garden status throughout the summer. 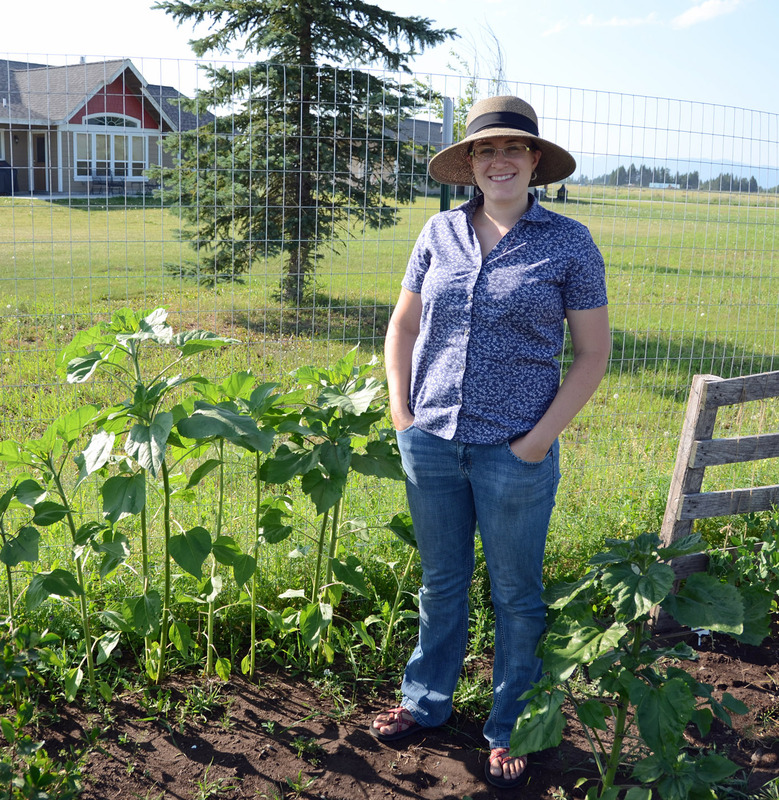 In addition to my own garden, I’m planning to work on a local farm (possibly two) some this summer in exchange for veggies. Good training for me, and good food. Excitement! How does your garden grow? … Mine? Slowly. OK, I’ve been promising a garden update for some time now. So here it is! It’s been an interesting season for me. I live in a place that’s sort of on the cusp of both zones 3 and 4 (less than 100-day growing season). Which means it’s hard to grow here! 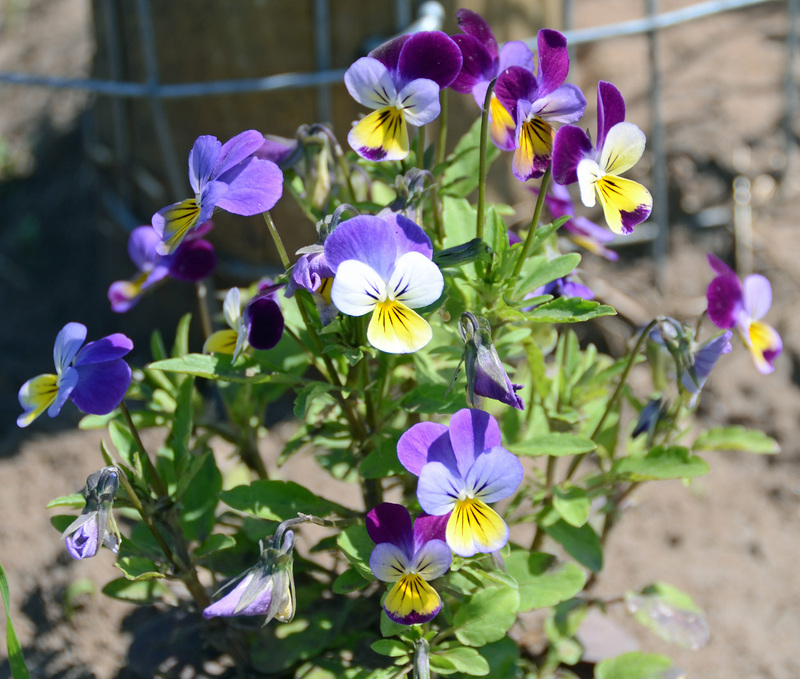 I would have liked to start planting in March, but was delayed until May because of snow and frost. So my garden looks woefully behind those of friends in friendlier climates it would seem. 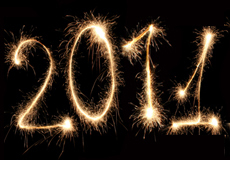 But despite that, I’ve had some successes, some failures and overall a fun time. In the front garden, I planted an assortment of flowers and raspberry cane. 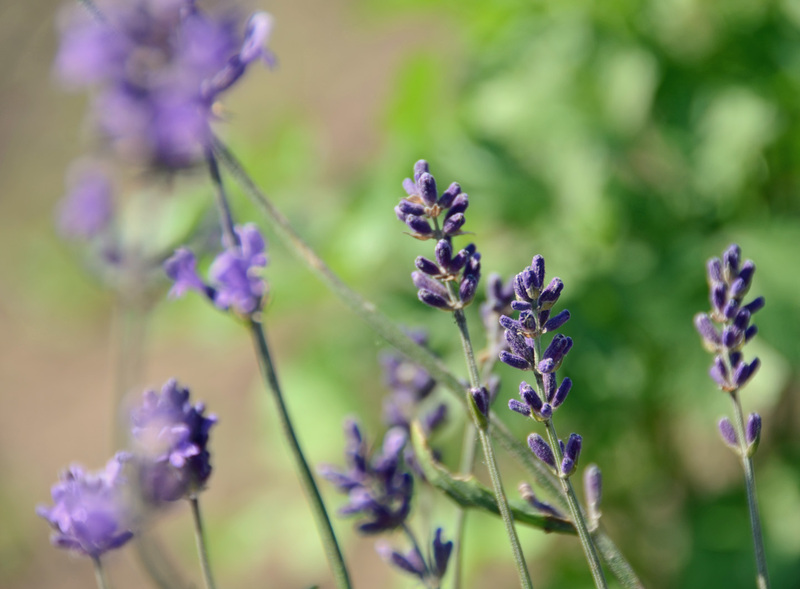 The flowers that are thriving are bachelor’s button (the photo above) in white, lavender and blue and orange poppies. My sunflowers are coming up FINALLY, but they’re only six inches or so tall and I don’t know if they’ll make it to six feet before the frost. They’re Mexican torches, supposed to be bright orange. 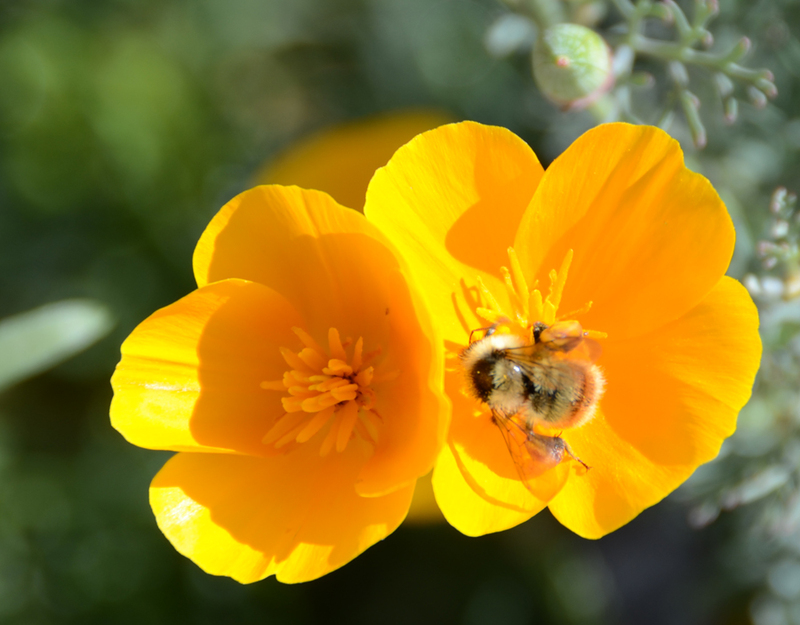 There was a bee buzzing around the poppies yesterday. I have to be careful to water the front garden every day. I usually dump two water pails on it, most of which goes to the raspberries. Since the garden is south facing and narrow against brick, it’s a hot place and the flowers and raspberries need a lot of hydration. My romaine is going positively gangbusters. 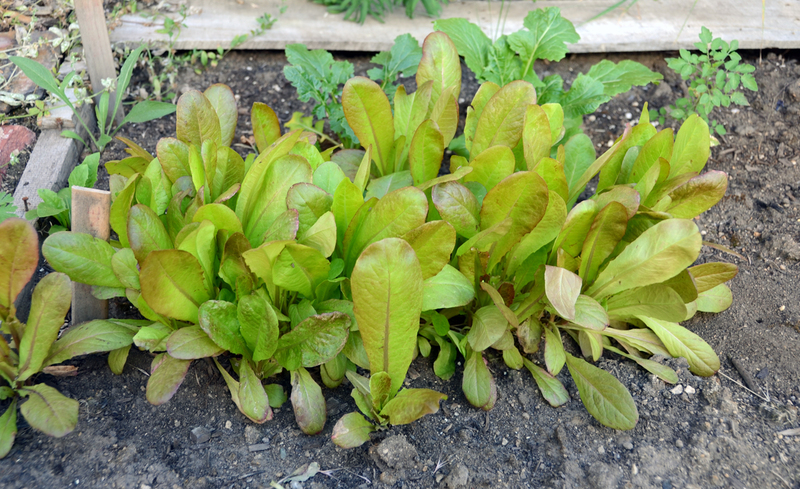 The spinach bolted at the first sign of heat (sigh), but the romaine just keeps on going. 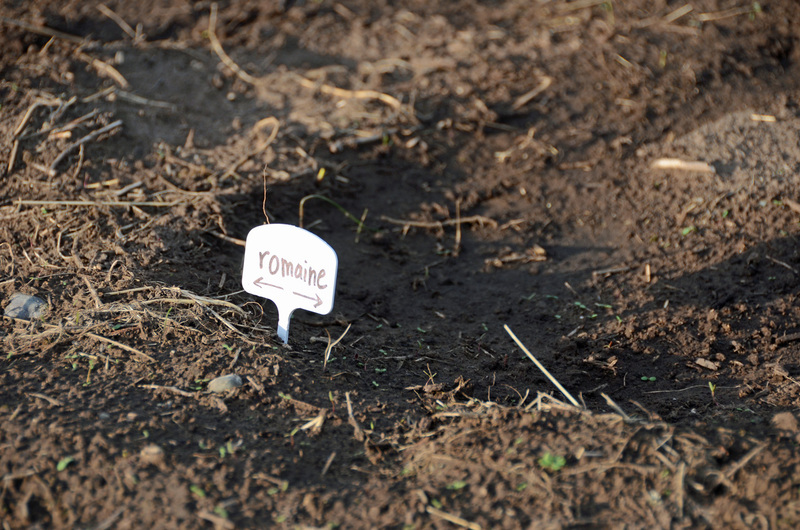 We’ve had a number of salads from the romaine patch now! Those salads always taste fabulous because about five minutes before they were eaten the lettuce was still in the ground. 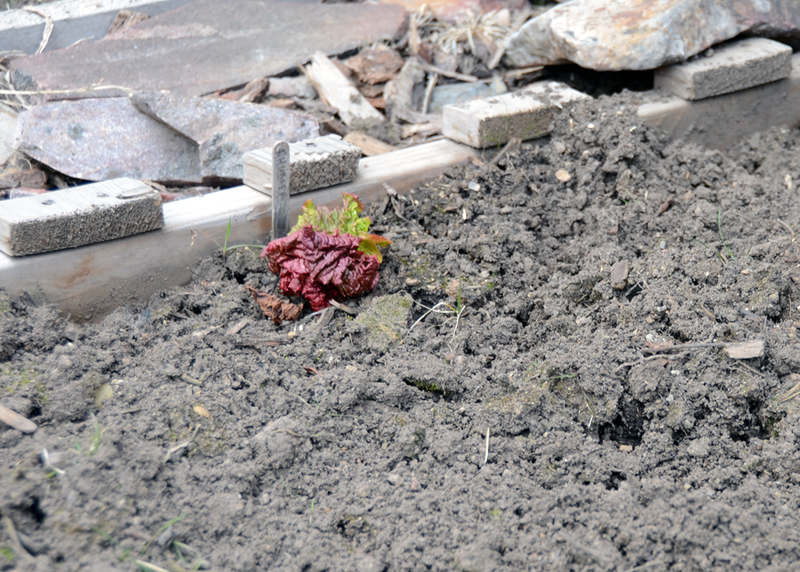 The rhubarb is still growing like the giant beast it is. I had to somewhat decapitate it yesterday because it was shading out the beans. The carrots, which I’ve gradually thinned, seem to be growing well. When I thinned yesterday, I pulled out some tiny carrot nublets. Despite being only a centimeter or two long, they were delicious and orange! I thinned the onions again, as well as the rainbow chard. 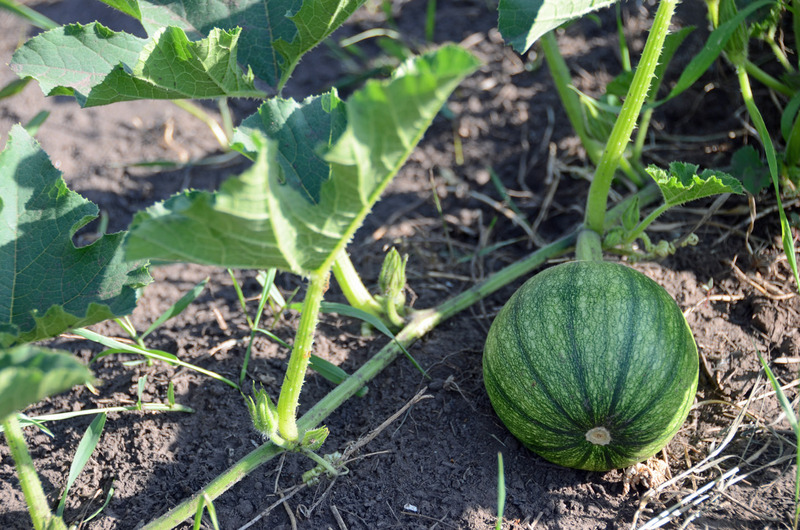 The pumpkins and squash I planted must have drowned in the couple long rains we got a few days after I planted. Alas, they wouldn’t have made it anyway, I don’t think. Too short a growing season. 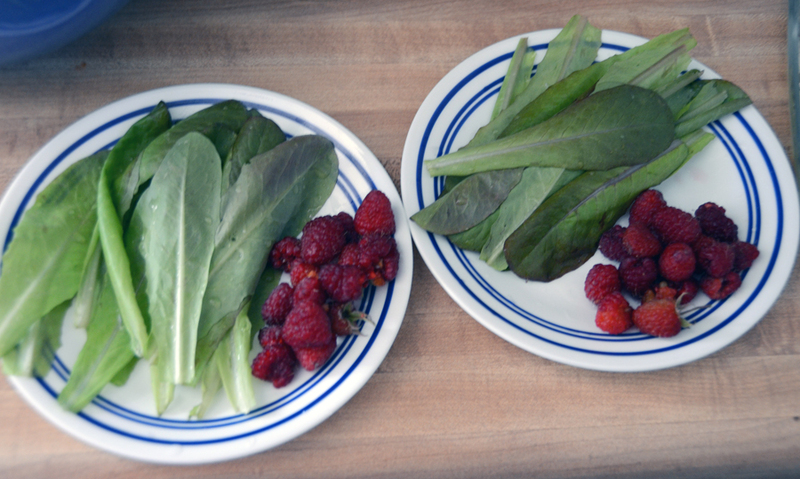 Raspberries and romaine from the garden. 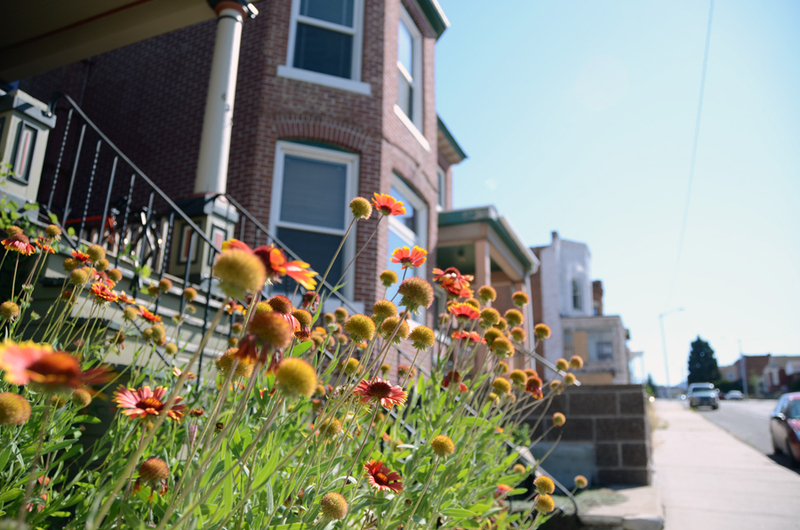 I also toddled up the street a few houses to snap some photos of a neighbor’s flower garden. It’s really quite beautiful. 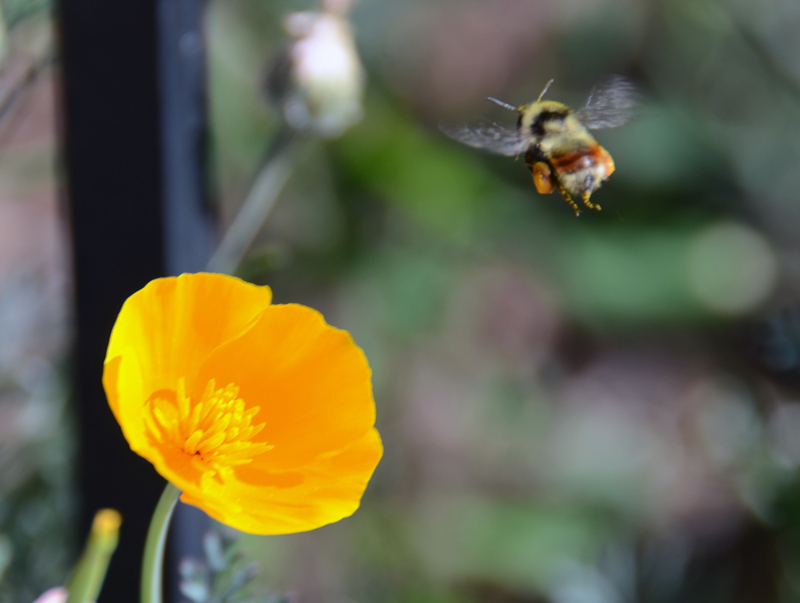 The folks who live in the house must have the garden planted in a succession because there are have been flowers there since May and they’re always changing. These red and yellow sunflowers are called Velvet Queens. 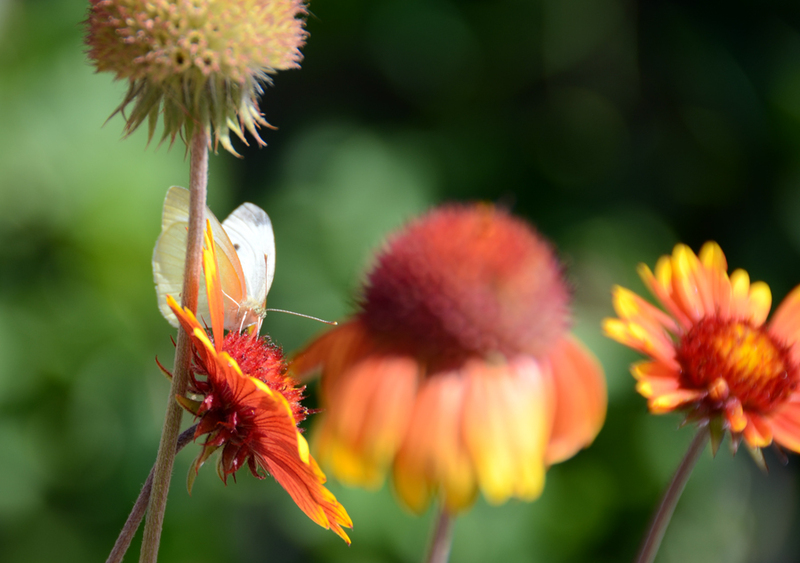 The pretty white butterfly was having a heyday amidst these beauties. In addition to the Velvet Queens, the neighbor’s garden has some great orange lilies, but I’d have to go up the stairs and into the garden to gets good shots of those and well, that’s creepy. In other news, my husband and I are moving about an hour east Friday. We’re moving so we can both go to school. Shawn will be doing most of the commuting, but I’ll be taking a free bus to campus. I’m so excited for school to start! I am so NOT excited to move. The only thing that’s really keeping me going on the packing process is the knowledge that the new apartment has a dishwasher, washer and dryer. Amenities I’ve lived without for four years. It’s time to rejoin modern society. Huzzah! I’m sad to be leaving the garden behind, but we’re planning some veggies raids later on in the season. On the positive side, though our new apartment doesn’t have a yard or space for a garden, we’ve already located a community garden nearby that I hope to join. 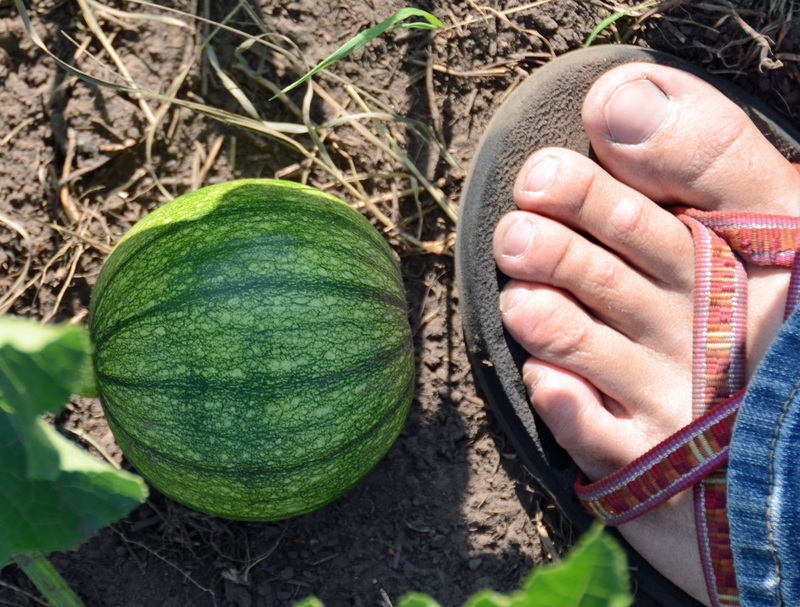 I hope your gardening this summer has been successful and delicious!